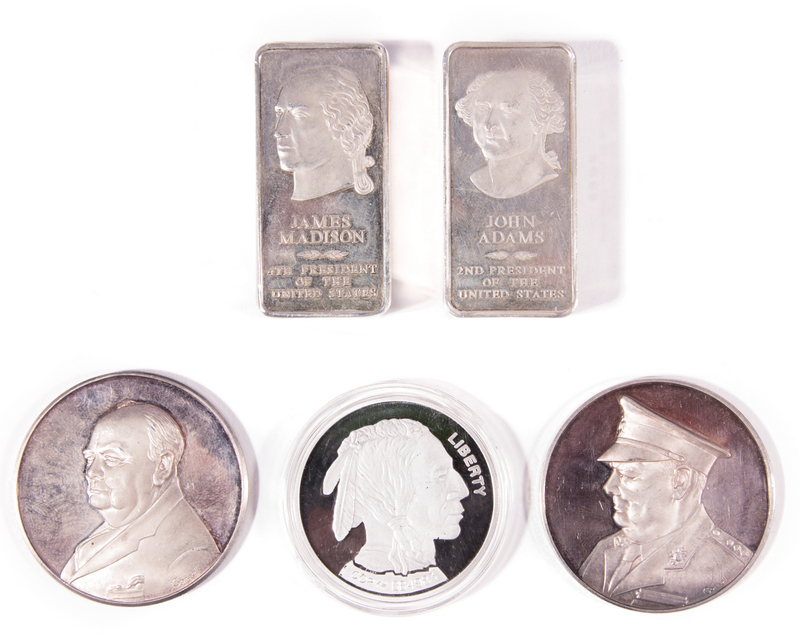 1st & 2nd items: 2 collectible Presidential sterling silver ingots, representing Presidents John Adams and James Madison. 2500 grains each, 10.450 troy ounces total. 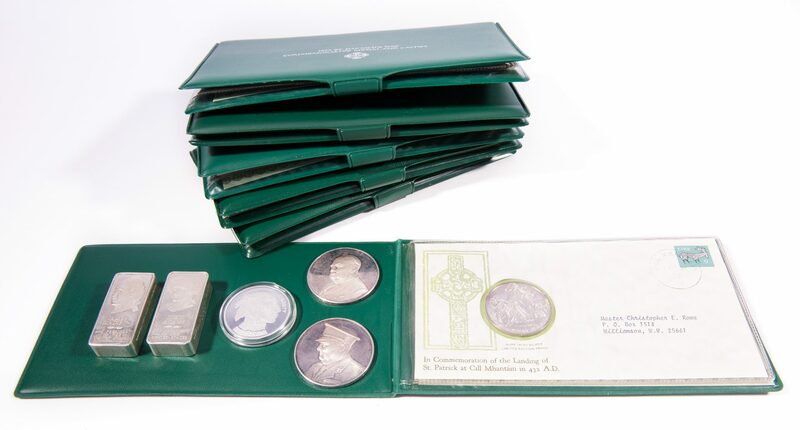 3rd & 4th items: 2 1970 Sir Winston Churchill sterling silver commemorative medals, by artist David Cornell for American Express, originally from a set of four (4). Each marked on the edge Winston Churchill Antique Sterling Silver A. E." and numbered. Both with images of Churchill to the front with speech excerpts to the reverse. 1 3/4" dia. 2.435 total troy ounces. 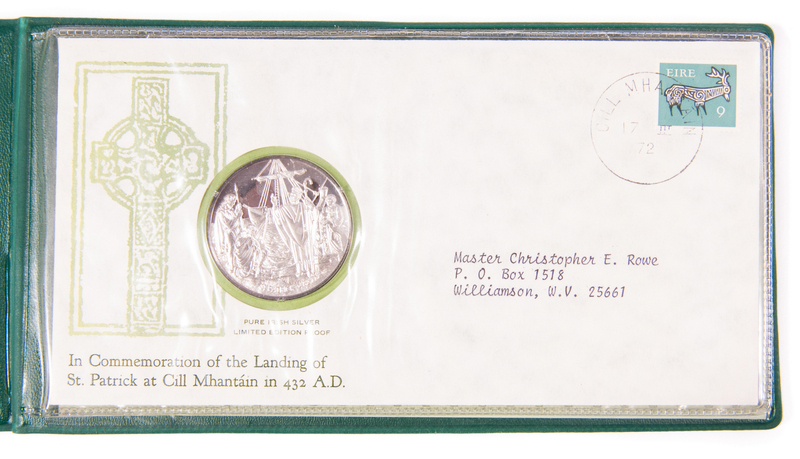 5th item: 2001 commemorative American Buffalo silver coin, one of a set of two, depicting an Indian Chief based upon a combination of three different Indian chiefs who had posed for James Earle Fraser in the early 20th century to one side and a bison on the reverse. 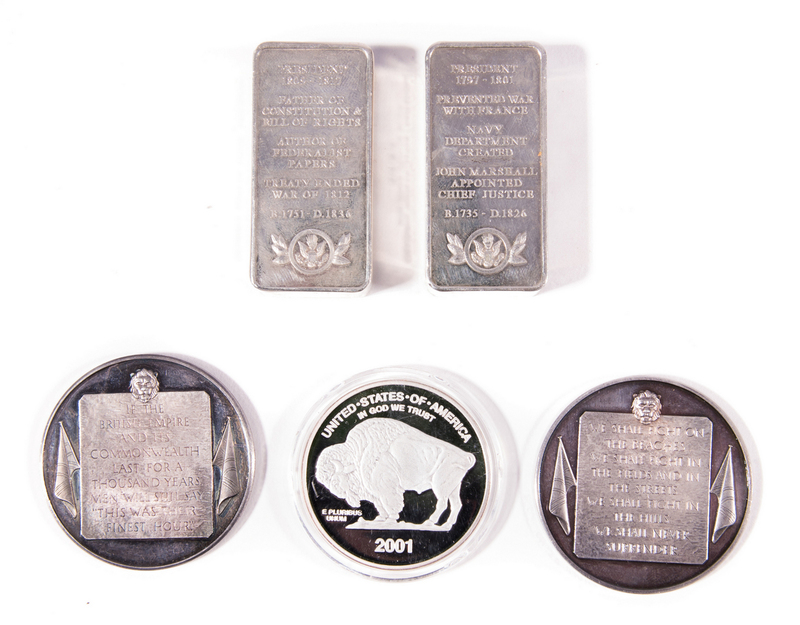 Housed in a protective plastic case, not marked, .860 troy ounces. 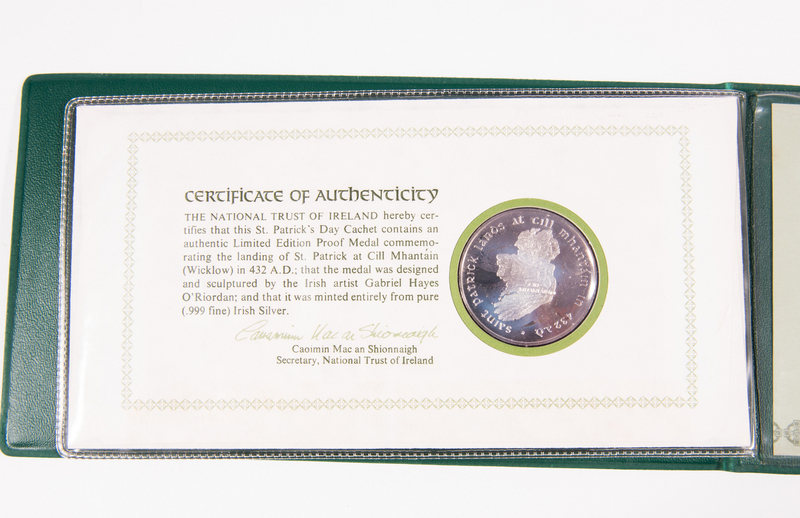 6th – 11th items: 6 Fraklin Mint St. Patrick's Day Commemorative Medals, .999 pure Irish silver, in commemoration of the Lighting of the Paschal Fire by St. Patrick at Teamhair Breagh in 433 AD. 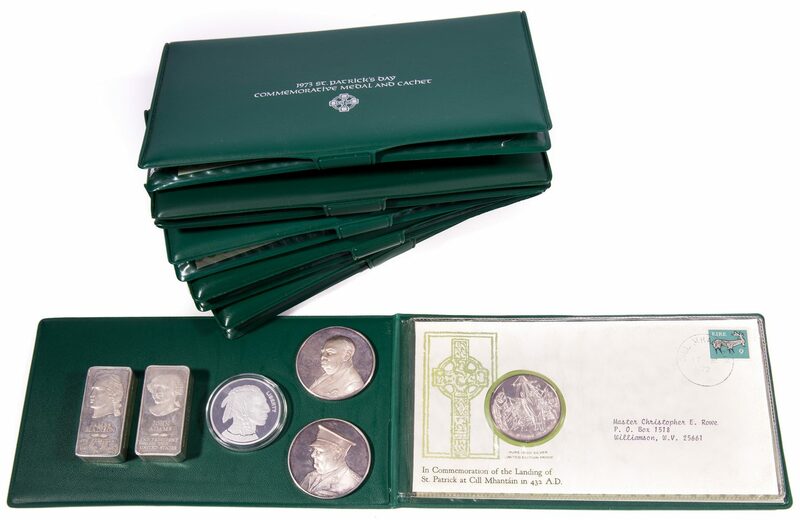 Dates include 1972-1975, each weighing .825 troy ounces. 4.95 total troy ounces. 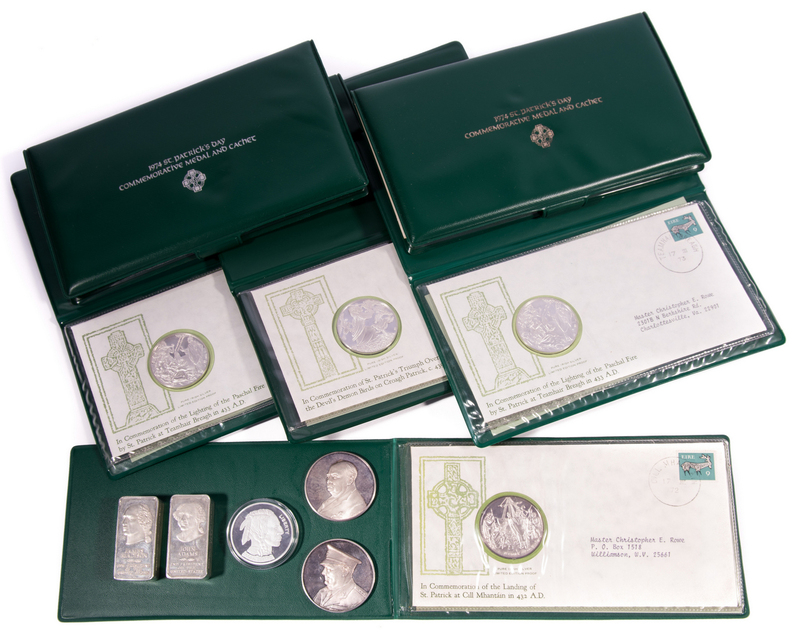 Housed in the original cases with certificates of authenticity. 18.54 total troy ounces for all. Private Knoxville, Tennessee collection. CONDITION: 1st-4th items: Minor surface wear. 5th – Minor surface wear. 6th-11th items: All very good, mint condition, housed in the original cases.